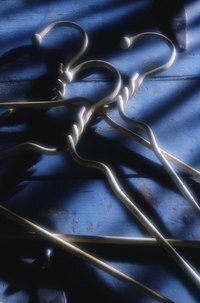 Metal clothes hangers are not only a functional clothing organization tool, but they are a strong crafting material that is extremely easy to work with. You can shape a hanger into a circle to use as a crafted basketball hoop, wall decor, or a dream catcher. You can shape a hanger into a heart shape to create an elaborate Valentine gift, or a heart-shaped wall piece. With small hand tools, you can creatively bend clothes hangers into different shapes to use as a guideline for larger crafts. Cut the wrapped wire and hook off the hanger with wire cutters. This will leave a triangular shape to work with. Bend the center of the large, bottom section upward to form a diamond shape with the hanger. Use pliers to grip and bend the hanger. Curve the top two sides with pliers. Carefully pull up on the center of each side and push down on the open end to create the curves of the heart. Push the side corners together to overlap the ends of the curves. Twist the ends together to close the heart shape. Straighten out the curved areas on the hanger. Grip the hanger immediately after a curve and straighten out the hanger. Shape the hanger around the coffee can. Wrap the hanger tightly around the can to create a seamless curve throughout the hanger. Cut excess hanger wire from the can with wire cutters. Leave 1 inch of hanger overlapping on each end. Remove the hanger from the coffee can and twist the hanger ends together using pliers.